“Growing Objects” is a series of kinetic sculptures that illustrate natural growth processes. 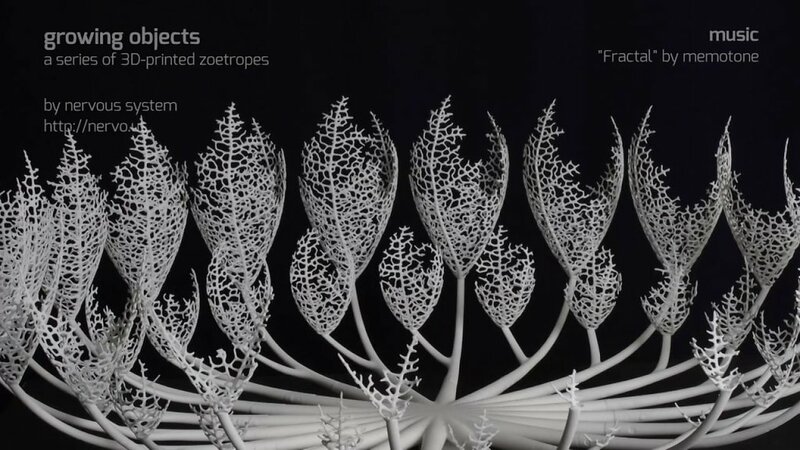 Inspired by 19th century zoetropes, these interactive sculptures consist of 3D printed objects that when spun and illuminated animate the development of complex forms; when still, they allow the viewer to examine each step of the growth process. Our zoetropes reimagine some of the earliest ancestors of modern day cinema and animation: the phenokistoscope, zoetrope and praxinoscope. We’re fascinated by these devices because they are fundamentally interactive and participatory, enabling the viewer to deconstruct the animation process. We are adapting this kinetic apparatus to illustrate and explain our algorithmic art process via 3D printing.